We had family in town for a Memorial Day weekend full of food, walks, flower planting, and the occasional thunderstorm/tornado. It was a great weekend in spite of that last part. 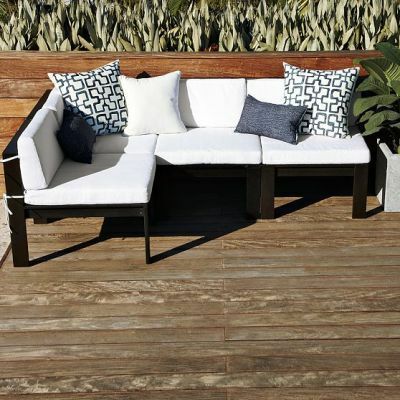 :) We also managed to knock out a little patio project while some very willing babysitters kept an eye on Baby B.
I've had my eye on this outdoor collection (picture below) from West Elm, but it cost $149-279 per piece! That was never going to happen for us. So we knew we would have to build it if we wanted to have a sectional for our patio. Fortunately for us, Ana White already had plans for a similar sectional on her website! (Want to build your own? You can find the plans here and here.) It turned out great and looks just like what I wanted! We did make a few changes from her plans, mainly because we used 2x4s instead of 1x4s, so we had to adjust some measurements to get the same overall dimensions. We chose 2x4s because they were actually about 1/2 the cost, but a bonus for me was the chunkier look we got with the 2x4s. So, ready to make your own? Step 2: over hang should be 1 1/2" instead of 3/4"
Step 5: You will have 13 1/2" below the seat back board instead of 14 1/4". Step 5: You will have 13 1/2" below the seat back board instead of 15" to the top of the board. 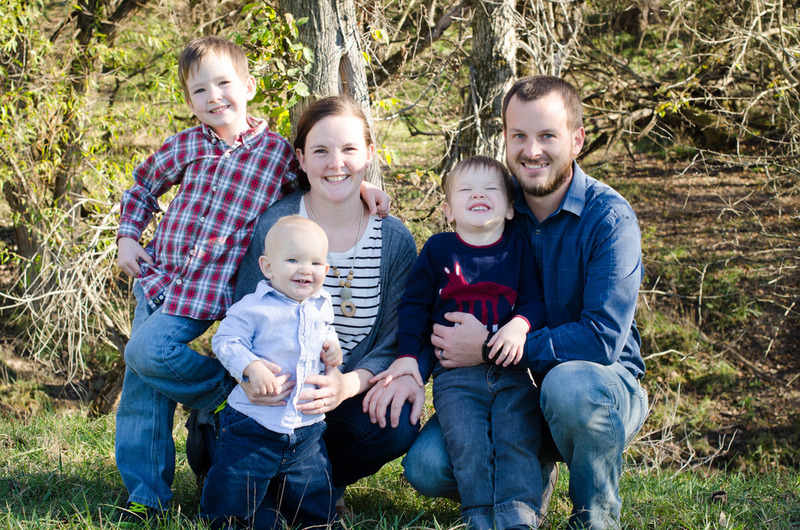 I had fun on this project using my first mother's day present - a miter saw! It made the cutting go SO much faster. I also broke in my Kreg Jig, which resulted in very sturdy furniture with almost no screw holes showing. I think it also made things go a lot faster. We're still planning to add some coffee table squares (plans here) and maybe a few chairs of some kind down the line. 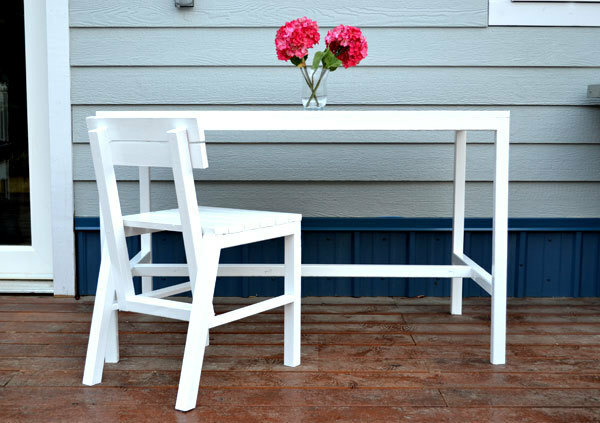 I'd also love to have this table set, but we may not have room for it on our current patio. And just for the record, you probably shouldn't work in flip flops because 1) you might hurt your feet and 2) you'll probably ruin your nail polish. So there you have our little weekend project. We can't wait to finish turning this patio into a great summer hang out! I love that it is sturdy. It will take the climbing and crawling of rowdy kids and also be very stable for an elderly person who has problems with regular lawn chairs. Practical and stylish. . . way to go. Thanks! That was definitely a bonus of using 2x4s. And I think the Kreg Jig helped make the joints really strong, too. Can you please check your measurement for the front apron on the corner piece? Started it last night and the total width came up way too long. I dry fitted the seat sides the seat boards and the seat boards do not fit, they are too short. I'm sure it's that apron measurement that is off. I'd appreciate it. Well we've started the corner piece twice and still haven't gotten any where, ha. I believe it's possibly all operator error. :) All other sections are now built so we'll definitely be tackling this piece next. Thinking the measurements might be ok after all. Will let you know how it turns out! Oh no! Sorry you are having trouble. :( I will run out and check the measurements after nap time. And yes, do let me know how it turns out!! Still had issues with the corner piece, but I'm not sure exactly why. I get frustrated quickly so my hubby dealt with it. It might have been us. Who knows! Regardless it is done! I'd post a pic here, but the paste function doesn't seem to work in this field. It's posted on Ana's site . Thanx again for the mod's measurements! Sorry you had so much trouble. That is so discouraging when you are working on a project. :( I'm glad you got it figured out in the end, and I will definitely check it out on Ana's site! Great job detailing everything. We're going to use your plans. Looks fantastic. Thank you. Great! I'd love to hear how it turns out for you. Have fun building! Love, love, love this!! So beautiful! I'm having my "handy" husband build something similar on our new deck. How do you feel about the straight back? He was going to angle them. I tried this project (armless) and came up short with two of the measurements. For the 2 – 2×4 @ 24 1/4" (Seat Side Aprons), I had to make them 24 1/2" and for the 2 – 2×4 @ 22 1/4" (Seat Supports) I had to go 23" instead. Are those just typos or what? There were some that didn't match up on the corner pieces too, but I can't remember what they are right now. I just went and remeasured everything and my (Seat Supports) were actually 22 3/4", which is still shorter than you came up, and my (Seat Side Aprons) are what I stated and all my other measurements match, so I'm not sure where the difference is coming from. We've had problems with other projects where the thickness or width of our boards (from the lumber store) were off from what they were supposed to be and we had to adjust our measurements. Maybe you had the same problem? I'm really sorry you had trouble. I'm sure that was super frustrating. :( Thanks for letting me know that there was a problem, I've updated the plans to correct the measurement I had wrong so hopefully that will help in the future. Sorry again! Did you use steel Kreg screws? I am thinking that the regular zinc may not hold in outdoor weather (SE Michigan). Thank you for commenting! Let me know how it works out for you and I'll adjust the plans if needed. We used these blue-kote weather resistant screws. Side Aprons = 24 1/2"
I purchased my screws before your reply. I ended up purchasing Stainless Steel Screws Kreg from Amazon. It was a big mistake. The reviews were correct. These are not good quality screws like their others. I managed to destroy 2 driver bits and also 2 screws were stuck without fully driven due to the screw head getting rounded while driving them in. So, I finally finished the job using "Grip-Rite 5-lb #9- 2.5-in x 2.5-in Pan-Head Polymer-Coated Star-Drive Composite Deck Screw" from Lowes. Not a single screw jammed or had any problem. I will soon use your adjustments to make a corner chair. Thanks again for providing your measurements for 2x4s. Thanks so much for the feedback! I adjusted the plans to reflect your measurements (and sorry to Jesse for not changing them sooner!). Sorry to hear about your trouble with the steel screws, but I'm glad you found something that worked so well. And I wonder if those are cheaper than the Kreg brand screws we used? I'll have to compare next time! Last night, I finished 1 corner chair. All your measurements are perfect. Thanks again. 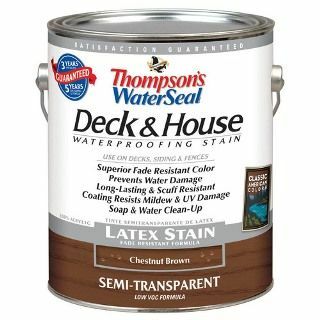 How is your latex stain holding up? So glad to hear it. Thanks again! 2) Folks all filled up with the backyard food! Thank you! We'll definitely test out #2. I'm getting hungry just thinking about it. :) Thanks for commenting! Great job looks really good! The only thing I would different (you noted this) is to map out the pocket holes ahead of time, you could hide all your pocket hole on the outside of arms where two pieces come together, or on the corner on the back side of the arm supports. Yes, thank you! I definitely should have planned ahead of time. Oh well, live & learn I guess. :) Hopefully this helps anyone else who gives it a try! Thanks! You should glue some pieces of foam core together with foam adhesive and cover them yourself to make the back cushions. You could even use batting over the foam core if you wanted them to be softer. Foam core is good for so many things! That is such a great idea! I would love to have the look of the west elm cushions instead of the pillows. I will have to give this a try, thanks so much for the suggestion! Use the foam and cover with batting to make it softer then cover with fabric. I would make extension tabs with velcro to wrap to the back and fasten. You could use a 2-3 inch tab on each end or if I were doing it, I would make one tab that would stretch from side to side. Joanne Fabric has a pretty big selection of outdoor fabrics that are water and sun resistant! You could use those to cover whatever foam or cushions you want to use. Another option would be a waterproofing spray you can also get at Joanne that can be sprayed on regular fabrics to make them water resistant, but I don't know how well something like that holds up in the long run. And good luck! I'd love to see pics when you are done! I saw someone on Pinterest used shower curtains to cover outdoor cushions, might be less expensive than waterproof fabric. What type of wood did you use? Pressure treated? Thinking about trying to start this project this weekend! Wish me luck! I just used regular construction grade 2x4's. But mine is under a roof so it's not exposed to the elements as much as something out in the open. I probably would have used treated wood if that was the case. :) I used a deck sealer to finish them so I'm hoping that will be enough to make them last. After their first winter they still look as good as ever! This looks great! My hubby and I are very excited to try this! Sectionals are soooo expensive. Thank you! It's a little crazy how much they cost. :) Have fun making your own! Are the instructions or steps located somewhere? I started it but have questions on a few of the side pieces. I didn't want to post the plans since I didn't write them, I just modified it to use a different lumber size! :) Good luck! Love this! Would be really cool if the corner peice was made with the seat in the herring bone style. Not sure if I spelled that right. My husby will be making this very soon! Hello,I am about to head to the store to buy everything needed.I have only one question so far.What size screws did you buy?Since everything is with 2x4's now.Thank you!It looks amazing! With the Kreg Jig we used 2 1/2" screws. Without it, you'll need at least 2" to go through boards the thin way, and at least 4" if you're going through the wider way. Hope that makes sense! I plan on using my kreg to try this for the first time? So all I need is the 2.5 inch blue screws? Do i need any others? Also did you use glue on all joints? I did glue all the joints. Better safe than sorry! I do think you could do it all with the kreg screws. There are a couple places it's nice to reinforce without the kreg holes (like screwing the legs to the aprons, which can be done from the back so it won't be visible) but you could use the kreg screws in those places if you don't want to buy a set of regular screws. :) Good luck! Im trying to figure which length of 2x4 to purchase to get the most out of it. What did you use? 8/10/12/or 16 ft pieces? Oh man, I'm sorry, I don't understand what you're asking. :( Did you read through Ana's instructions? what size cushions did you buy/ do I need to look for? thanks! Georgia, where can I find the step by step instructions for the corner seat? I made thecregularvseats but didn't see instructions on Ana's website for the corner seat. Thanks. We are building this now and are having issues with the corner sections too. We're not even sure what our issue it :) but pics of the underneath of the corner section would help us big time too!! Ahhh, what a great idea! I will take an underneath picture for you tomorrow. :) Sorry you're having trouble. The corner section is tricky! I remember we had trouble when we first built it too. I'll get you a pic tomorrow! I think I figured out the source of the confusion... Your amended cut list has both aprons (front and side) set at 24.5" when one of them (probably the side) has to be 1.5" shorter. When they are joined together, both sides should be of equal length. An alternate approach to Chris’ is to reduce the length of the Front Apron from 24 1/2 to 23 inches. The Front Apron is the blue board in Step 1. I tried this yesterday and it worked out very well... Best of luck with your chairs. How did you attach each piece? On Ana's website she did it with scrap 2x4's. Did you do the same? We used a Kreg Jig for parts of it, but other parts we just used a regular drill and screws (2 1/2" or 4", depending on how far they need to reach). 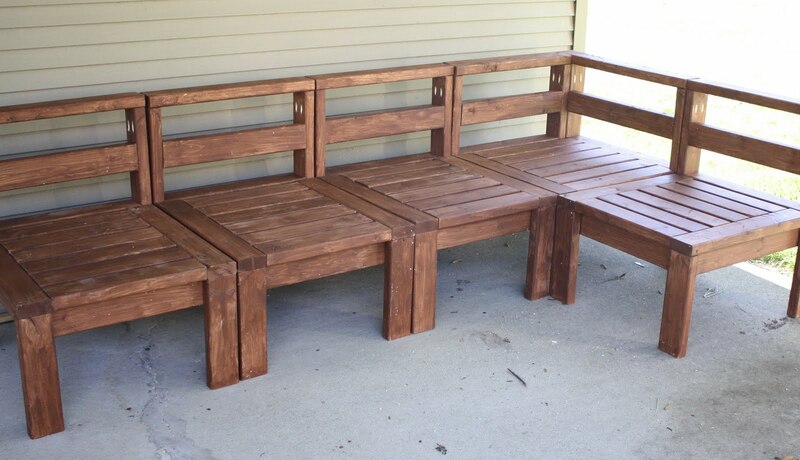 You could definitely do the whole thing without a Kreg Jig! Be sure to use glue as well. We did not use scrap 2x4's. I would have it we had any, ha ha. :) But we had to buy some for the project. I think kheckl was asking how you connected each individual sectional seat to the next one... Ana's plans used a small scrap of 2x4 between the seats which she screwed through. I think kheckl (and myself) want to know if that gap is still the same, or if we need a different width of wood. Ahhhh, thank you!! Mine are not attached to each other at all, they are pretty heavy so I just set them side by side and they stay. And then I can rearrange them whenever the mood strikes! :) I'm not sure on the size of the gap, I'll have to run out and measure. My wife and I will be starting this project in a week or so. I'm super excited...Thanks for the great idea. Hi, I scanned the comments and hope I am not repeating a previous question. Roughly, how many 2x4 (x92 5/8) boards are needed to construct one section? I am building 7 sections and an estimate of wood materials would be appreciated. Hey, just started this project, am very excited. I did however notice that this list wasn't updated with the new lengths. Thanks so much! Trying to plan out how many to build, how wide is each section? I love this project but have a comment. When you put the cushion on, there is not much height for back cushion and support. I will be modifying this so that the back of these benches come to shoulder blade heigt for comfort. Ted above is correct - I just made the corner piece last night and the front apron cut is too long - you need to reduce the length of the Front Apron from 24 1/2 to 23 inches otherwise when you measure 3.5" from one end to put the inside supports the seat will not fit inside the back frame which has a width of 21" - you should fix this dimension above. Planning on making these this spring. What type of wood did you use for this project? If you just used pressure treated wood how has it held up (warping). For some reason we are finding it really hard to find 2x4's in woods such as cedar in our area. 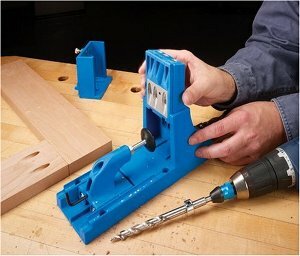 I love this plan, however when reviewing the Kreg Jig system, they state it is 'for materials from 1/2"- to 11/2"-thick', so how did it work with 2" thick wood? These measurements assume that the back apron lies flush with the back of the back legs. The way the measurements are provided currently, the back apron would need to be installed 0.25” in from the back in order to meet with the seat supports and seat side aprons. The plans are not currently available on her Ana's page, do you have a copy? I don't, but they seem to be up now. Not something I thought of before, but I probably should have a copy in case it happens again! Thanks! I don't, but they seem to be working now. Never thought of it before, but I probably should have a copy in case that happens again! Thanks! The link on Ana's page says "not found" - I built one set of these, but am building a second set. Obviously I can use my original set for measurements, but it would be much simpler from your plans again. Do you have a different link? 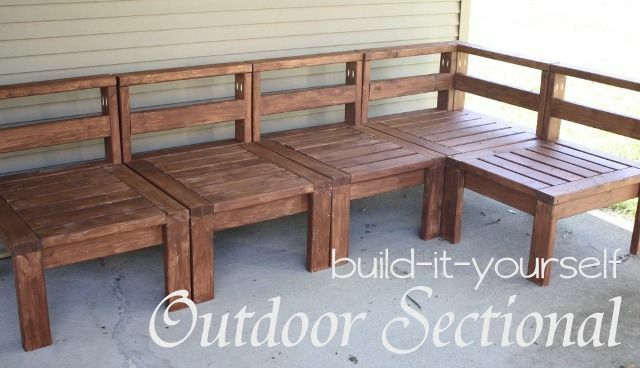 We recently featured your DIY sectional in our round up on patio projects at http://www.thebudgetdecorator.com/patio-perfection-diy-projects/ I couldn't find the contact form on your page, so I hope it's ok to send this along as a comment! Great project! Please let us know if you have any issues you would like us to correct with your project feature, and we hope you enjoy some great traffic from it! Have an amazing week! Looks great, thanks so much! *note to self: add contact info to my page* Thanks again! I just put this together yesterday, & I did not have any problems with the pieces fitting together. I guess all of the measurements and cuts have been updated? I noticed you did not put the arm rails on the end sections, do you wish you would have for you happy that you left them open? Hi....thanks so much for posting this using 2x4s. Something about using 1x4s seems a little unstable. So I’m gonna be making this soon for a friend of mine for her new patio. She wants the seating to be 17-18 inches high like a normal bench or chair height. I’m great at following directions but terrible at math and figuring out measurements on my own. Could you tell me what I would need to adjust in order to make the seats that tall and also to make the backs taller as well. Thanks for your help. I really appreciate your help. Hi! To make an 18" high seat you just need to cut all the legs 3" longer. So the front legs will be cut 16.5" long and the back legs will be 30.5" long. That will give you the exact same sectional, just higher off the ground. If you want the back to be taller than mine, you need to add a few more inches to the back legs (in addition to the 3" to raise the seat). Hope that helps!